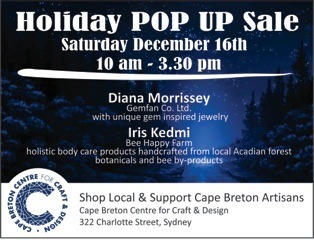 Join us on Saturday, December 16, 2017 from 10:00 a.m. until 3:30 p.m. for a pop-up shop with Gemfan and Bee Happy Farm! A pop-up shop is a one day sales event where the artisan sells directly to customers. This event will take place in the Centre’s Gallery Shop at 322 Charlotte Street in Sydney. For more information, contact Holley at 902 270 7491.